Sympathy and empathy are words that are often used interchangeably. However, they are two very different things, and the differences between them matter. Empathy is about putting yourself in someone else’s shoes. You do not have to have experienced what the person whose shoes you are temporarily ‘occupying’ has, but it is about trying to relate to that person. The best way to relate is by listening to what the person is saying. Sympathy is about those worn out old platitudes. Things that are said because they are ‘expected’, and that are said without really listening. Sympathy often involves a sentence preceded by those exasperating words ‘at least’. Sympathy is often about trying to make things better – an understandable, natural, human reaction to want to take away someone’s pain. But, of course, it does not work that way. Many times, it can have the opposite effect and put a wedge between people. The wonderful video in this post explains more about the difference between sympathy and empathy, and why that difference matters. Put simply, as Dr Bene Brown, the voice in the video says, empathy fuels connection with others because it is about engaging with feelings on both sides. 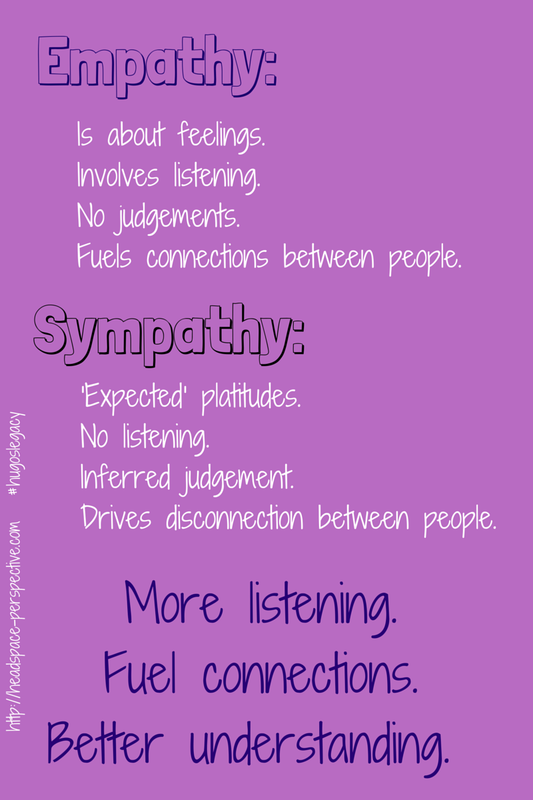 Sympathy, on the other hand, drives disconnection because it fails to listen, fails to engage with feelings, fails to consider what the other person really needs (and those needs rarely include empty, meaningless phrases). Many of the traditional ‘sympathy’ phrases – things like “Time is a great healer”, “Be positive,” “It was for the best,” “They are not suffering anymore”, “It’s ok to not be ok”, “There is always something to be thankful for” (you can probably add your own) – are telling someone how they should feel. Grief is entirely individual, and the grieving person has to respond to their grief in a way that is relevant to them. How they respond may change over time. The difficulty with the platitudes detailed above is that they infer a judgement about how the person is grieving, the time they are taking over their grief, or how they are feeling. I tend to read undertones in to the platitudes: “Aren’t you over it yet?”; “You should feel ok about the terrifying emotions, they are normal you know” – and I know other bereaved people have similar responses. Who likes to feel like they are being judged? It is unpleasant at the best of times, and even worse when you are feeling vulnerable and over-sensitive. There have been occasions where I have told someone about Hugo, and about what has happened to me in the past year. The other person has told me things like “To be positive”; “You’ll have another baby, you’ll see;” “Time is a great healer.” I have found myself getting cross: because those platitudes irritate me; because grief is not that easy; and because they have not listened to me (in fact, sometimes they have interrupted or talked over me). If they had taken the time to listen to what I had to say, to listen to me tell my story, we could have had a proper conversation. Afterwards, I often feel cross about feeling cross – after all, I try to rationalise, that person was just trying to be kind. They saw I was in pain, and they wanted to make me better. But then I feel cross about that sentiment, too. What a muddle. If only our culture was better at dealing with grief, if we were more open about talking about death, I cannot help thinking these conversations would be much easier. The power of and importance of listening has been mentioned in several of my posts. Many of us aren’t good at listening, not proper listening anyway – we can be too keen to talk about ourselves, or to give our opinions. The next time you are listening to someone talk about their sorrows, whatever those sorrows are, try to resist the temptation to show sympathy. Instead, demonstrate empathy through active listening. Active listening is where the listener shows the person speaking that they really are listening by, for example, repeating or paraphrasing what the person has said. This really is a great gift to give to someone in emotional turmoil, especially amongst so much well-intended sympathy. Admittedly, empathetic listening can be a challenge, because you are engaging with the other person’s pain. It is something positive you can do if you truly want to help the other person, though. Words will not take away the pain, but the pain can be eased a little, for a while, by someone giving them your undivided attention, not offering opinions or judgement. Just put yourself in their shoes for a moment. Which would you prefer: distant sympathy, or genuine empathetic connection? I wish I had words adequate for your devastating loss. How we grieve is so individual, you are right. A most important thing which I found has helped me is to have compassion for myself for wherever I am at. Well writen as ever, Leigh, although I don’t necessarily think the problem is sympathy per se as much as people who think that sympathy and empathy are the same thing. They’re not – not even close – as you so succinctly put it. Anyone can offer sympathy, few can exhibit genuine empathy. This is such a well written post, Leigh. There is an ocean of difference between sympathy and empathy, and I think people often reach for sympathetic phrases out of fear about facing sadness, at taking on the at times ugliness and messiness of grief. It’s “easier” to say a platitude then actually attempt to put yourself in another’s painful shoes and imagine what it feels like. Sadly, you know this from experience, but perhaps your words will help others pause before they go on autopilot. Sometimes, just listening with kindness, offering a hug or a hand to hold, is all that is necessary. I love this post and I hope that many will see it! I was blown away by that video when I saw it, and I shared it on Facebook over the holidays. I know that I wasn’t always the most empathetic person before having gone through this experience — and I’m still not always as empathetic as I would like, but I am working on it! Now I know how important it is and what an enormous difference it can make to someone who is suffering.